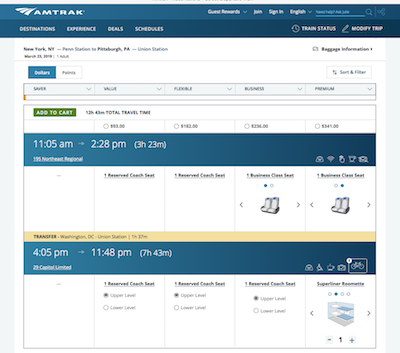 I'm searching for a train from NY Penn station to Pittsburgh, on Saturday the 23rd of March. This one looks good, but it seems to say that the journey will last 12 hours, contradicting the times given more prominently. What's going on? This is clipped from Amtrak's website. I just looked this up. The trip you have selected is a two part trip with a change of trains in Washington DC. The first part is the 195 Northeast Regional from Penn Station to Washington, Union Station. This is followed by taking the 29 Capital Limited from Union Station to Pittsburgh Union station. The 3:23 is just the NYC/DC leg trip time. Scroll down a bit to see the 7:43 duration from DC to the 'burgh. Not the answer you're looking for? Browse other questions tagged usa trains amtrak or ask your own question. Never received paper tickets for home delivery, what to do?